Lisa Buie-Collard - Author : It’s Over, Right? No Way! It’s Over, Right? No Way! I’m sad this morning that the A-to-Z blogging challenge is over. I’m also very happy that I followed through and actually blogged 26 times in April! It was a great journey and I met many lovely people with great blogs along the way. Thank you to all who came, read, stayed or just visited. 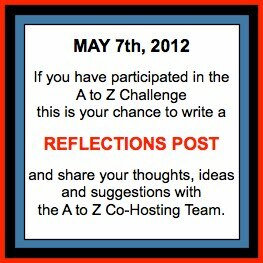 I’ll be participating in the next stage, the A-to-Z Reflections blog coming on May 7th. Hope you’ll join me there! I'll be there Lisa and will look forward to your post.